How about a revived CCC for Minnesota? ENEWS: Blueprint in Olivia, Reclaiming our Democracy, Where’s Our Train? A little more than a year ago, Ethan (last name withheld at his request) was headed in no particular direction, except perhaps toward trouble. He lacked motivation, was not doing particularly well in high school, and his scrapes with authorities worried his mother and teachers. His mom -- before signing him up for a special non-profit training program in small engine repair through the Lakes Center for Youth and Families (serving Chisago and Washington counties) -- knew that he had mechanical aptitude. She wrote to program officials then: “He can take things apart at home, but can’t put them back together. Hopefully this program can help him.” One year later, 18-year-old Ethan is putting things back together, literally and figuratively. This fall, he’s headed for Northland Technical College in Thief River Falls and an aviation mechanics program, with the added bonus of a $1,000 scholarship from the local Forest Lake Community Scholarship Fund. Ethan’s story provides important lessons in how non-profits, businesses and educators can address the statewide workforce mismatch, particularly in Greater Minnesota and rural exurban areas where manufacturers and other blue-collar employers can’t find skilled workers and where young adults like Ethan desperately need skills and credentials. Minnesota’s advanced manufacturing leaders report that they can’t find enough workers and are looking at shutting down production lines, or thinking about moving. Often these manufacturers offer livable wage jobs, good benefits, training and career paths. Often they are located in proximity to dozens of under-employed youth, like Ethan. In Minnesota, both our rural and inner-city regions share an underemployment rate that is often double the average in our most affluent suburbs. Statewide, thousands of youth are capable of working these jobs, with the right kind of intervention, on-the-job training and social support. The relation between manufacturers and temp (temporary employment) agencies are part of the problem. Manufacturers have downsized and outsourced their human resource departments to these agencies, which have been known to screen candidates more intently than manufacturers themselves, eliminating people from certain demographics, especially those who have been in trouble with the law, or in some cases, people who live in certain zip codes. Temp agencies may often “bait and switch” exceptionally productive workers to get manufacturers to buy out their contracts. Youth simply don’t know how to navigate these complex relationships--one of the many hurdles to a gainful career in manufacturing. Another problem is that too many high-school students simply don’t know about manufacturing or jobs in the trades. Minnesota high schools suffer from an 800:1 ratio of students to guidance counsellors, one of the worst gaps in the nation. If the counsellors aren’t writing college reference letters, they are tending to truants. As a result, many students lack knowledge about good local career options, and those for whom college is a financial or academic reach often leave high school with no plans for the future, and no path to get to a vocational career. Meanwhile, in most high schools, yesteryear’s shop classes and home economics courses and other vocational tracks have gradually disappeared, creating a bachelor’s degree-or-nothing mindset. If youth want to learn about good local blue-collar options and businesses, and technical areas, they have to look outside of the high school curriculum. Ethan’s Tried and True program was created with assistance from the Minnesota Initiative Foundation’s Financial Resiliency through Social Enterprise program (FRSE), which included a combination of training, consulting services, technical assistance and grant support. Also aided by the Sundance Family Foundation, the Lakes Center for Youth and Families’ (LC4YF’s) Tried and True Small Engines was launched in February 2016, and Ethan was one of its first beneficiaries. LC4YF, a youth development organization serving the Forest Lake area and surrounding communities since 1976, had always envisioned an entrepreneurial venture that would prepare youth for the workforce and provide an earned income for programming. 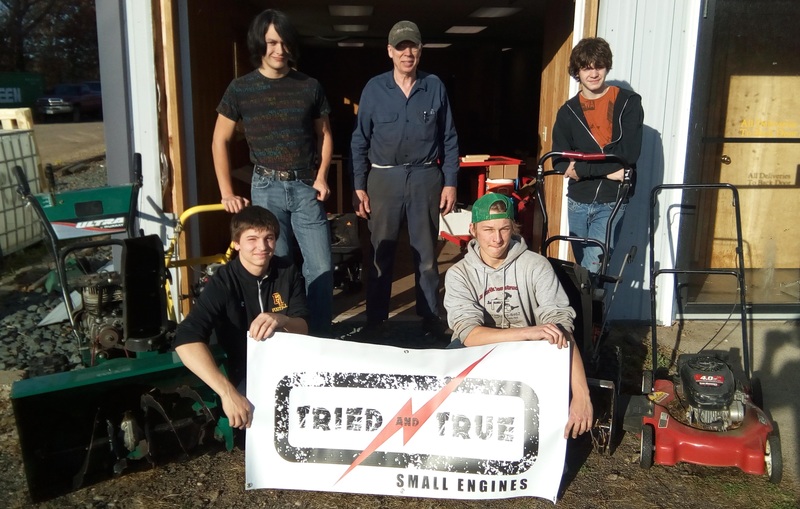 Tried and True teaches youth business skills and professional experience in the field of mechanics which leads towards apprenticeships and jobs. All the machines that need repair are donated by the community. Repaired machines are then sold back to the community with the proceeds going to support Tried and True. The youth work under the supervision of a professional mechanic with decades of experience. Adult LC4YF volunteers and staff provide intergenerational experiences and opportunities for valuable organic mentoring – a specific goal of the Youth Social Entrepreneurship initiative. LC4YF is also part of a cohort through the Sundance Foundation in a Wilder Research program to provide YSE programs with data capacity skills and tools. Cohort members have developed logic models, evaluation plans, selected appropriate tools and have shifted from relying upon spreadsheets to using databases. Cohort members have been able to collect, analyze and report preliminary evidence based data. As a result, LC4YF is prepared to apply to larger sources of state and federal contract money, national foundation grants, and other funds which will give an even broader impact to the entrepreneurial experiences LC4YF is providing for at-risk youth. Youth bond with positive adult role models of all ages and begin to understand their value to the community. They develop a sense of purpose and often become more optimistic about their personal future. Ethan’s experience proves the model. After joining Tried and True in June of 2016, he discovered that his perceived proficiency with mechanical stuff was real, that he could put things back together, and by the end of the first three-month session, he was taking projects on by himself and even helping others. Ethan was then offered an apprenticeship, meaning he could get a stipend for mentoring other youth in the program. The seasoned lead mechanic and supervisor, Jim Goserud, says “He’s got what it takes to have a career in this field. He’ll do well in whatever mechanical field he chooses to get into.” It should be obvious that when young adults like Ethan do well, we all do well. Research consistently shows that effective Career Pathways training programs boost economic productivity while reducing demand for government corrections and welfare costs. Minnesota’s policy-makers need to strengthen and invest in any and all of these more proven pathway models. Jeanne Walz and Matt Howard are, respectively, the Executive Director and Program Director for the Lakes Center for Youth and Families (LC4YF), based in Forest Lake and serving parts of Washington County and all of Chisago County. Dane Smith is the president of Growth & Justice, a policy research and advocacy organization that seeks a more inclusive prosperity for Minnesota.